First it was the ten-year, 100,000-mile warranty. Then it was the option to return your car if you lost your job. Now Hyundai says it will guarantee the future trade-in value of its new vehicles, starting May 1. Customers will have to document that they have completed all factory-recommended maintenance at a Hyundai dealer. If they do that, thethe company will guarantee what the trade-in value of that vehicle will be after the second full year of ownership through the fourth year. That requirement may help shore up what car dealers call “service retention” – meaning that owners bring their cars to the dealer for service rather than going to an independent garage. Hyundai has long trailed industry leaders Honda, Toyota and Ford in that measurement. Thenewprogram, called Hyundai Assurance Trade-in Value Guarantee, will base the future trade in values on residual values set by Automotive Lease Guide. "Depreciation is the single highest cost of car ownership," Hyundai CEO John Krafcik said in a statement. "While Hyundai's depreciation is now among the lowest in the industry, Assurance will remove many of the barriers and concerns about vehicle ownership." When Hyundai ended its job-loss program last month, it said it had a new promotion in the works, and this is apparently it. With or without special programs, Hyundai's sales have been on a tear recently. Through March, sales were up 28 percent over the previous year. The earthquake disaster in Japan, which has slowed production of many Japanese and American models, may also be a factor. 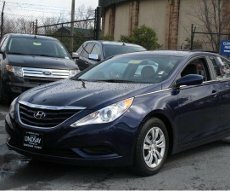 But while Hyundai is good at promoting its lengthy warranty and other sales incentives, not all Hyundai owners have a good experience. Many have encountered truly alarming problems, including rusted-out frames. “I have a 2001 Hyundai Santa Fe with a sub frame that has actually rusted to the point of breaking and have one bolt holding on my right front tire,” said Kandi of Livermore Falls, Maine. The National Highway Traffic Safety Administration (NHTSA) became aware of that and related problems in 2008, when it found that some models of the Hyundai Sonata can rust so severely along the sub-frame that the front wheels collapse or separate from the vehicle. Some models were later, but the recall was limited to cars that were sold in the “salt belt,” northern states that use salt to de-ice their roads. Shannon of Dunmore, Pa., was told her Sonata wasn't included in the recall, even though Pennsylvania certainly qualifies for the salt belt. “The frame is rotted exactly the same as the recalled Sonatas,” she said.